Union County Freeholders Daniel Sullivan (L) and Bette Jane Kowalski (R) present resolutions to members of the Union County Adopt-A-Trail Chainsaw Crew thanking them for removing nearly 900 fallen trees from along hiking and bridle trails in the Watchung Reservation, Lenape Park and Ash Brook Reservation last year. 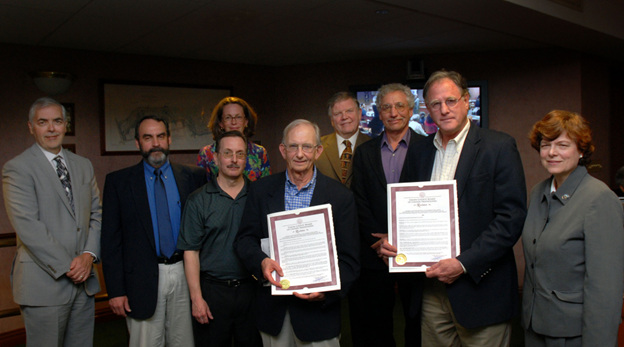 The Freeholder Board commended and honored the trained volunteer group for their efforts and time donated throughout 2011, but especially following Hurricane Irene and the October Nor’easter. The Chainsaw Crew members are (from left): Rich Palmatier, Jane Osman, Sal Coppa, Bob Czaja, Bill Wallis, Larry Russo and Ned O’Connell.